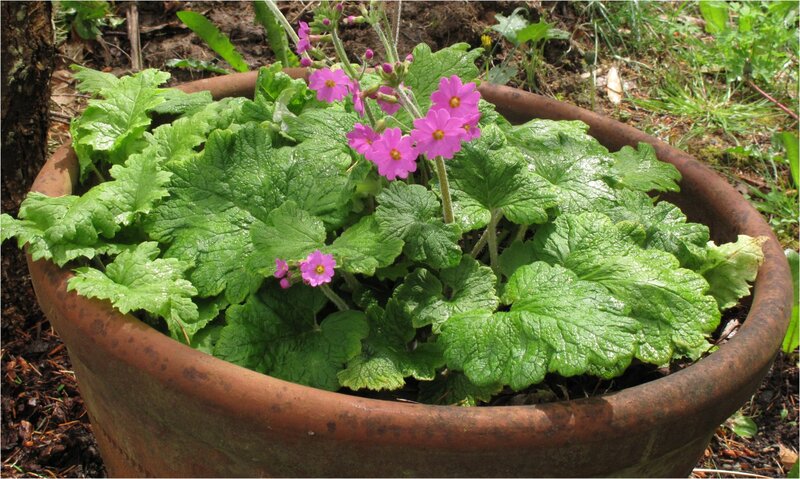 Here’s a shade loving primrose species that deserves wider use in American gardens. 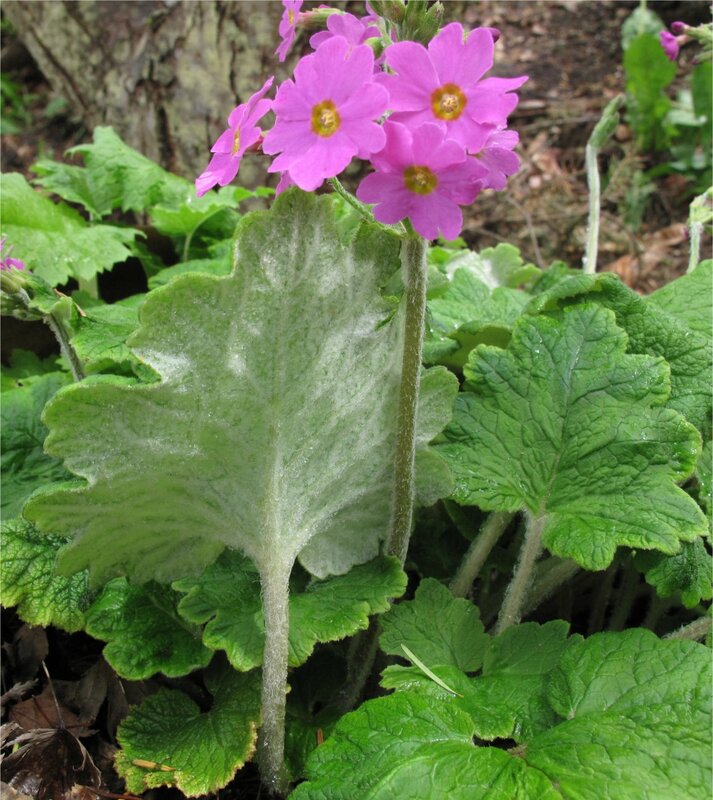 Primula polyneura is an underutilized species primrose native to western China. In the wild, this species shows variability, probably in flower color, but in cultivation it’s quite reliable, coming true from seed. Each year the clump, with somewhat hairy leaves and stems, enlarges. The undersides of the leaves are typical of this section of central and eastern Asia primulas known as Cortusoides. I’m growing it in a pot (but it would do equally well in the ground). This year it is definitely bigger than last year. (It was originally a gift of a tiny seedling). I’ve rarely seen it in the nursery trade. When I Google it, mainly British nurseries come up. It’s clearly happy in our Puget Sound climate, but I believe with a Zone 4-8 rating it would be happy in colder parts of North America. Here’s more detailed information from two older Primrose reference books. P. polyneura is a long-lived, free flowering and undemanding plant for a cool, sheltered, moisture-retentaive but well drained site in peaty or “woodsey” soil…It’s readily grown from seed and can be propagated by division. — from Primula by John Richards, Timber Press 1993, 2003. First described in 1895 by M. Franchet as fairly common in parts of western China. It is described as being a variable plant in the wild, but in cultivation it is fairly consistent. The typical Cortusoides leaves are densely felted on the undersides and are unmistakable. 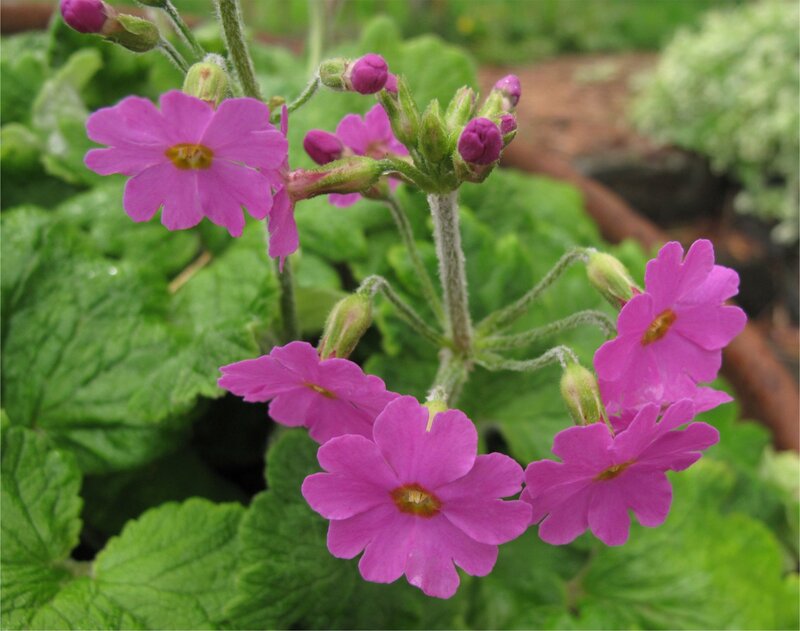 the flowers are in loose heads on the 6-inch (15cm) stems appearing in May, and are a particularly virulent pink — lovely to relieve the gloom under shrubs or a shady corner. It dies back completely for winter, but is reliable and hardy. A worthwile plant, not offered as often as one would like. CULTIVATION: Easy and permanent in the peat bed, or in a cool position in moist soil under dwarf shrubs. PROPAGATION: Readily from seed or by dividing established clumps in early spring. AVAILABILITY: specialist nurseries or seed lists. — from Primulas: The Complete Guide, by Mary A Robinson, The Crowood Press, Swindon, England, 1990. This year I plan to collect seeds; next spring I’ll divide the clump and plant directly in my shade garden. If you are interested in trying some seed, let me know and I’ll be happy to mail some off later this summer. 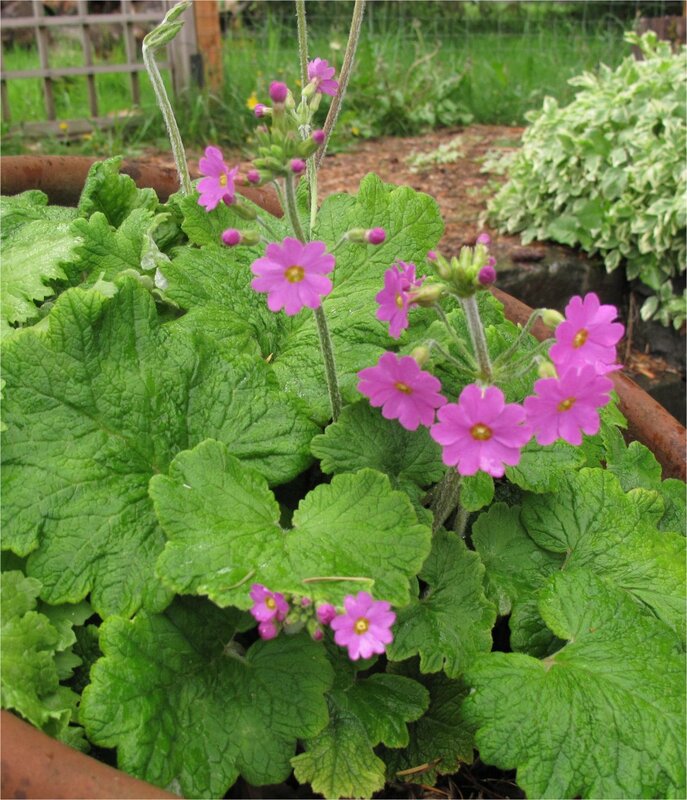 This entry was posted in Plant Picks and tagged Cortusoides Primroses, Primula polyneura by Bart Arenson. Bookmark the permalink.